Sarah Palin: She’s Just Like Us! The media’s 13 best non-stories about the former governor. Despite the fact that she no longer holds office, has not clarified her political intentions, and seems intent, mainly, on making money, Sarah Palin coverage show no signs of letting up. Her recently launched bus tour—for the all-important purpose, as she has stated, of inviting “more people to be interested in all that is good about America”—is no exception. As we parse the constant updates from Palin’s not-a-presidential campaign, let’s take a look at previously issued breaking news on our favorite obsession. Sarah Palin rides a bike. Palin revved up her tour at the “Rolling Thunder” motorcycle rally in Washington, DC this past weekend, despite a cold introduction from an event organizer. “This is not a political event,” legislative director Ted Shpak told MSNBC. “We’re not endorsing anybody, and she’s not speaking on our stage during our program.” Palin still got on a bike though, and the media was right behind her. Sarah Palin’s bus NOT hit by a tornado. Wednesday evening, Sarah Palin’s tour bus was traveling along Interstate 90 when it passed a section of the road covered with debris. “A tornado ripped across the road in front of the #palinbustour—we don’t know how many minutes difference yet,” tweeted Nico Hines, a Washington correspondent for The Times of London. The NBC News team covering the tour left to cover the tornado, depriving viewers of other important Palin near-miss updates. Sarah Palin wears shorts. Probing deep into an issue of utmost importance, HuffPo asked in a breaking news poll, "Michelle Obama vs. Sarah Palin: Whose shorts are more scandalous?" 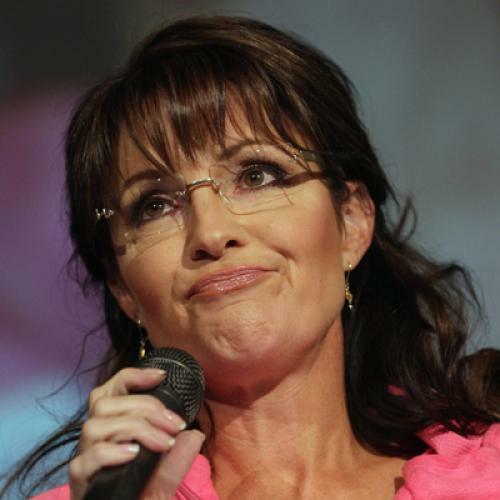 Sarah Palin’s almost son-in-law is arrested on drug charges. We all have a black sheep in the family, like that mustachioed uncle who tells inappropriate jokes at reunions—or in Palin’s case, that almost son-in-law whose mom gets arrested on drug charges and poses naked for Playgirl. As the old saying (almost) goes, you can pick your almost-friends, but not your almost-family, and Levi is good for any number of almost non-existent stories. Sarah Palin invites Levi Johnson to Thanksgiving. Post drug-bust, the magnanimous ex-governor invited Levi Johnston to partake in her family’s holiday meal on national television. Levi declined. In other breaking news, dealing with your daughter’s baby daddy can be awkward. Sarah Palin is not divorcing Todd. Despite rumors from People, sourced from Alaska Report, sourced from Levi Johnston’s manager, about a $20 million dollar divorce deal, HuffPo recently settled the case: All is exactly as it was on the marriage front. Glad that’s cleared up. Sarah Palin tries to trademark her name. To belay confusion with the other famous Palins, Sarah and Todd tried to trademark their names in February, both for “motivational speaking services.” Unfortunately, their application was denied. Sarah Palin’s daughter gets a TV show. Inspired by the success of “Sarah Palin’s Alaska,” Bristol Palin will be getting her own show about her action-packed life as a single mother living with her friends, Kyle and Christopher Massey, who she met as a contestant on “Dancing with the Stars.” Can’t wait for the TV series? Bristol's memoir, Not Afraid of Life, will be published this summer. Sarah Palin still fires guns. In March 2009, Palin was still hunting wolves from her helicopter, drawing criticism from the National Parks Service. Reporters have followed this fight over the legal and ecological propriety of this practice since at least 2007. Sarah Palin launches a website. Perhaps Business Insider’s recent revelation, "Sarah Palin's New Website is Up," isn’t breaking news. But here’s the catch: “Like all such web-sites, the key vertical is inside the ‘Donate’ button.” Why is the “Donate” button important? “How the donations page performs will determine, to some degree, whether or not she runs.” Incisive. Sarah Palin doesn’t like “Family Guy.” Palin, apparently, doesn’t like everything that the network that writes her paychecks produces. Her dislike of the animated show’s lewd gags set off an internecine struggle at the Fox network, with white-knight Bill O'Reilly quick to jump to Palin’s defense against potty-mouthed “Family Guy” creator Seth MacFarlane. President Obama doesn’t think about Sarah Palin. After Palin boasted to Barbara Walters that she could beat Obama in 2012, Walters put the question to the President himself. Could he win in a 2012 match-up with Palin? "I don't think about Sarah Palin," Obama replied. Lucky man. Kara Brandeisky and Alex Klein are interns at The New Republic.